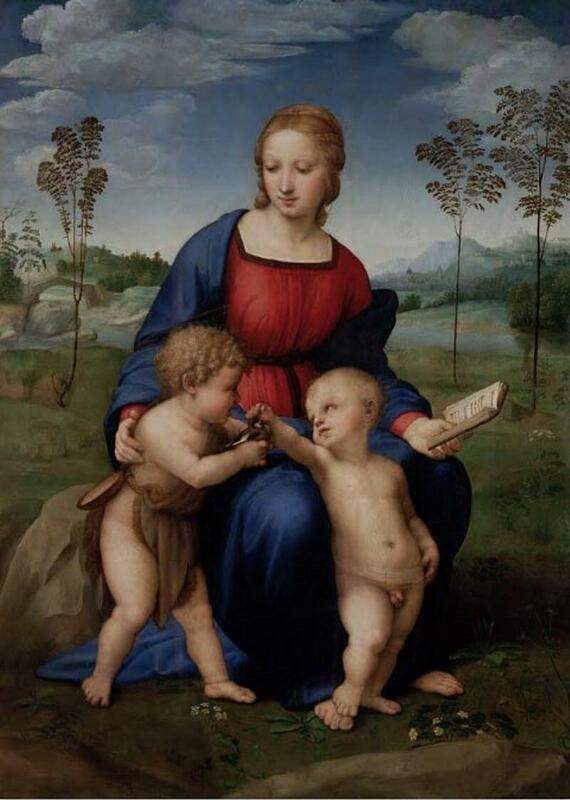 Raffaello painted the Madonna of the Goldfinch for a wealthy merchant in Florence, Lorenzo Nasi, on the occasion of his marriage to Sandra Canigiani. Unfortunately their house collapsed in 1547 and the painting was found in the rubble in 17 fragments. Before ending up in the collection of the Medici, the painting necessitated an important restoration. Sitting on a rock, in the foreground, there is Mary and baby Jesus resting on his legs. On the left, embraced by the Virgin, Saint John holding in his hands a goldfinch (symbolizing the passion of Christ) to let Jesus caress it. Mary turns her gaze to the little ones in a brief break from the reading she's holding in the left hand. The little book shows the bitter prophecy about his son's fate. The characters are collected in a rough pyramid shape reminiscent of the models used by Leonardo.